This recipe produces soft truffles that taste like gingerbread cookie dough. These Christmas candies feature gingersnaps, spices, toasted nuts, and white chocolate. Place the white chocolate in a large microwave-safe bowl and microwave until melted, stirring after every 45 seconds to prevent overheating. Once the white chocolate is melted, add the corn syrup, evaporated milk, and vanilla extract. If it seems to be separating, stir gently with a whisk until it comes back together. Stir in the gingersnap crumbs, powdered sugar, all the spices, the salt, and the chopped nuts. Place the mixture in the refrigerator until it is firm enough to shape, about 1 hour. 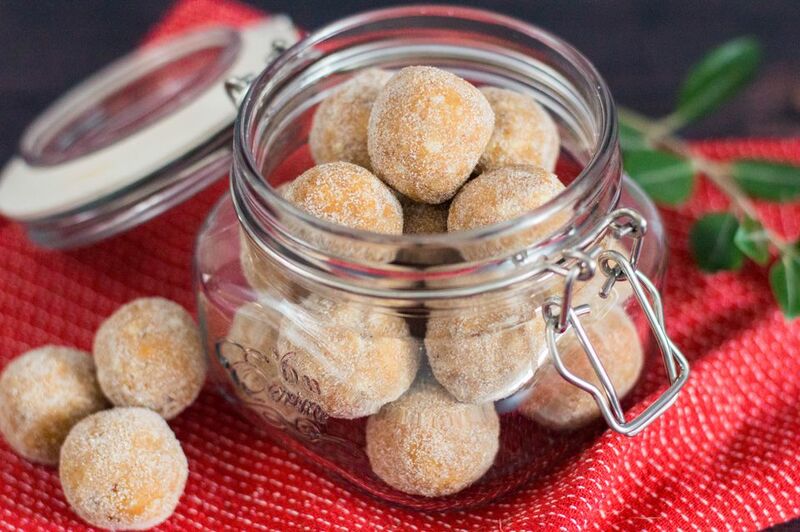 Using a teaspoon, roll the candy into small balls between your palms. Place the granulated sugar in a small bowl, and roll the balls in the sugar. Place the gingerbread truffles in an airtight container and store them in the refrigerator. To crush the gingersnaps, you can either use a blender or food processor, or place them in a large plastic bag and crush them with a rolling pin. Be sure that the cookies are in small crumbs, not large chunks. These candies store for several weeks, but they tend to lose some of their strong ginger flavor after about a week. Allow the truffles to come to room temperature before serving.